SharkSSL은 현재 나와있는 SSL 중에 최초 가장 작은 Size와 Best-Performing을 자랑하고 있으며, SSL v3.0 TLS v1.0/1.1/1.2 solution을 가지고 있습니다. Array of compile-time options과 함께, SharkSSL은 하나의 footprint로 세밀하게 조정 할 수 있으며, x.509 인증시 20kb 이내에서 행하여집니다. SharkSSL은 The ANSI C and Assembly-optimized big-integer libraries로 maximum performance를 제공하며, embedded device를 제어하는 data Secure로서는 최상의 제품이다. 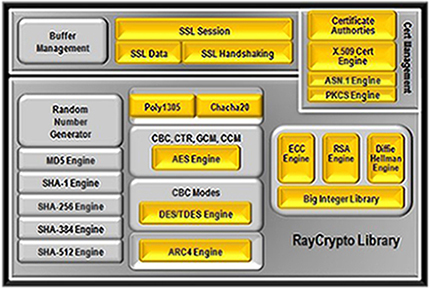 SharkSSL은 다양한 SoC(Industry processors : Freescale, TI, Atmel, ARM Core etc. )를 지원하며, hardware-assisted encryption 없이 Shark SSL로 충분히 Data 보안을 Cover 할 수 있습니다. SharkSSL은 uIP and lwIP in event driven mode를 지원한다. All additional protocols and examples들은 TCP/IP stacks으로 porting 되어있다. SharkSSL's transport agnostic API는 어떠한 bare-metal and/or hybrid hardware/software network stack 할지라도 아주 쉽고 간단하게 SSL stack에 porting 할 수 있다. The SharkSSL (standalone) package는 많은 examples and demonstrations를 가지고 있어 microcontroller 환경하에서 구현 할 수 있게 초점이 맞추어져있어 개발자는 편리하게 개발 할 수 있다. 아래의 정보는 다양한 예제를 개발자에게 제공 해 드릴 수 있으며, 필요하시면 저희 회사로 연락 주시면 언제든지 제공해 드리겠습니다. SharkSSL은 C source code WebSocket Client Library를 포함하고 있으며, WebSocket library는 Machine to Machine(M2M) 간의 WebSocket protocol base로 통신을 하게 되며, WebSocket protocol는 the device client와 the server 사이에 secure, persistent, asynchronous, and bi-directional connection을 제공한다. Minnow Servers는 embedded HTTPS and secure WebSocket server이다. 아주 작은microcontrollers(no external memory)에서 real-time web server로 동작한다. 또한 작은 device를 개발하는데 있어서 Barracuda Web Server 혹은 standard web applications 을 적용할 수 없을 경우 Minnow Server는 아주 이상적이다. The Device가 어디에 있던 위에 있는 모든 위치에서 web presentation을 저장하고, Firmware의 uploading 없이 쉽게 Application을 modify 할 수 있다. 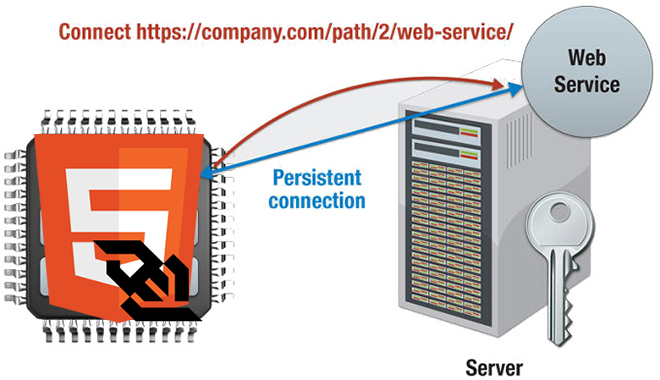 The WebSocket protocol은 RFC specifies으로 정의되어 있으며, standard HTTPS는 request/response pair를 request/response pair로 Upgrade 할 수 있다. 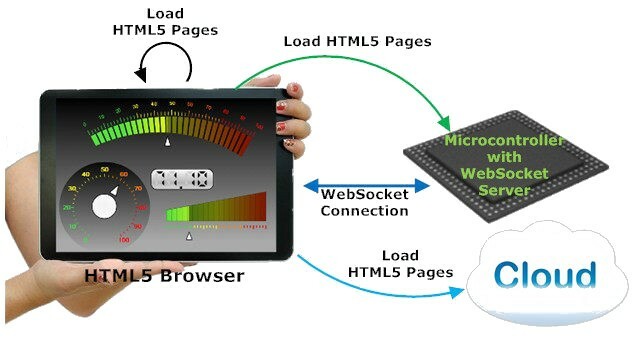 HTML WebSocket-based applications는 Server에 부담을 덜 주면서 real-time communication을 할 수 있다. IoT protocols 는 불필요한 메모리와 processing overhead 을 가지고 있을수 있다. . SharkSSL 는 두개의 examples programs 을 가지고 있으며 하나는 IoT Edge Node( device) 에서 단순히 SSL 과 함께 TCP/IP stack 과 combination 하여 사용되고, 그리고 다른 하나는 Server 와 Device 사이의 암호화 된 요금징수데이타 (payload data) 를 교환 하여 사용될수 있는 프로그램을 가지고있다. SharkSSL 는 Simple Mail Transfer Protocol (SMTP) C source code library 를 포함하고 있으며, 우리가 가지고있는 secure SMTP library 는 어떤 any secure SMTP server 아 통신할수있다. 요즘 대부분 SMTP servers 는 secure communication 을 요구한다. 우리의 SMTP library 는 Google Mail and Hotmail 처럼 online services S 상에서 적합한 보증을 하는 TARTTLS and SMTPS, 를 지원한다. PikeHTTP(S) client 는 어떤 web server 와 함게 device 와 통신하고 어떤 data type 이라할지라도 to upload and download 를 사용한다. Device 는 독립적으로 configuration files and software updates 파일을 회복 시키며, direct, one-by-one reconfiguration 없이 동시에 Large array Device 에 update 할 수 있다.